GOLDfor POOK COCONUT CHIPS from POOKSPAFOODS (Germany): crispy crispy Thai coconut chips. These coconut chips are vegan, gluten free and preservative free. They are suitable for a snack or as a garnish for salads, muesli, yogurt or ice cream. Available in 40g sachets and 3 perfumes. SILVER for ADORA by HM CLAUSE (Spain): a firm Marmande tomato, dark brown in color, with an intense and very balanced sweet and sour taste and an exceptional shelf life. 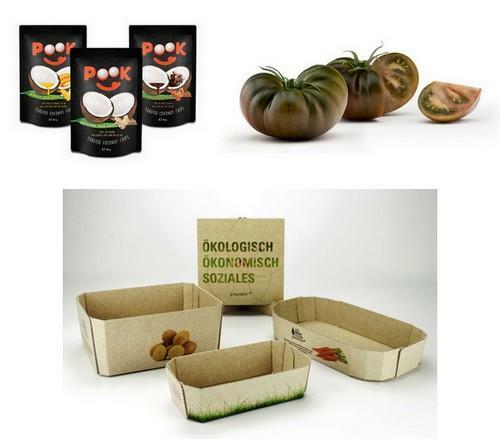 BRONZE for GRASS PAPER-GREENLINER from PAPIERFABRIK SCHEUFELEN (Germany): a new ecological material for Fruits & Vegetables composed of 50% fresh grass fiber, a raw material that leads to a considerable reduction in water and energy consumption. Les 3 gagnants du FLIA 2018.